During the last decade, proprioceptive training has been described as one of the most important aspects in a rehabilitation or training program. Training facilities often use the term “proprioceptive training” to describe balance exercises with the premise that it will prevent injuries to occur. Rehabilitation professionals also use “proprioceptive training” exercises as a mean to improve and recover the sensorimotor function. Proprioception and balance are two different concepts. However, balance tests are often used in order to assess proprioceptive function. Even for testing the efficacy of a training program on proprioceptive function, researchers often use balance measures or tests. So, this leads to an important question: are we really improving proprioception, or are we just improving balance? First, it’s important to understand the definitions of proprioception and balance. Proprioception involves awareness of joint position (joint position sense), movement (kinesthesia), and force, heaviness, and effort (force sense) (Martin and Jessell, 1991; Riemann and Lephart, 2002). Proprioception is the product of sensory information supplied by specialized nerve endings termed mechanoreceptors, i.e., transducers converting mechanical stimuli to action potentials for transmission to the CNS (Martin and Jessell, 1991; Yahia et al., 1992). According to this, proprioception is an unconsciously perception, an afferent information from the proprioceptors. The muscle spindles, found in all skeletal muscles in parallel with the extrafusal muscle fibers (Peck et al., 1984; Kulkarni et al., 2001; Banks, 2006) are considered the most important source of proprioception (Gordon and Ghez, 1991; Proske and Gandevia, 2012). They are highly sensitive and their density varies widely throughout the body, reflecting different functional demands. The sub-occipital muscles of the neck have an exceptionally high density of muscle spindles, thought to reflect the cervical spine’s unique role in head and eye movement control (Liu et al., 2003). Importantly the sensitivity of the muscle spindles can be adjusted via innervation of the polar ends of the intrafusal muscle fibers by gamma motorneurons (Gordon and Ghez, 1991). Joint proprioceptors have historically been considered “limit detectors”, stimulated at the extremes of joint range-of-motion (ROM) (Burgess and Clark, 1969). However it is now known that joint proprioceptors provide input throughout a joint’s entire ROM under both low and high load conditions stimulating strong discharges from the muscle spindle and are thus vital for joint stability (Sojka et al., 1989; Johansson et al., 1990; Needle et al., 2013). This is why mobility is so important to perception. If mobility is reduced, afferent information from the proprioceptors is likely to be negatively affected, resulting in less awareness. Balance is a mechanical term describing the state of an object when the resultant loads acting upon it are zero (Pollock et al., 2000). An object is in balance when its centre of gravity (COG) falls within its base of support (BOS), preventing falling. Human balance, or postural control, is the capacity of maintaining stability by changing line of gravity (LOG) within BOS, or by changing BOS in order to prevent falling (Pollock et al., 2000). The main difference between objects and humans is that among humans, even in the case that LOG falls out their BOS, that doesn’t mean falling, because we can recover balance through stepping or swaying, for example. Additionally, we also need LOG falling out their BOS, in order to accelerate, changing direction, and other sort of dynamic tasks. Therefore, human balance relates to the conscious and reflexive capacities to control their COG, LOG and BOS positions, relative to intrinsic and/or extrinsic disturbances. 3. What is proprioceptive training? Proprioceptive training is often described as single leg drills using different implements, such as unstable surfaces of various types. Unstable surfaces was assumed to create a proprioceptively enriched environment that progressively challenges the proprioceptors and nervous system. But is this an absolute truth? Analyzing the definition of proprioception stated in the beginning of this text, we can conclude that proprioceptive training refers to any type of intervention that promote proprioceptive feedback and afferent information to the CNS. So, even simple mobility drills are proprioceptive. Additionally, it is assumed that by doing exercises which stimulate proprioceptors, proprioception will improve, and that this improvement leads to improved balance. However, there is no evidence that proprioception can be improved by training. Balance improvements involves not only neuromuscular or musculoskeletal factors, but is also dependent on motor learning and CNS function. Instead, open-loop system (mainly efferent information from CNS to musculoskeletal system) assumes a very important role of preventing injuries to occur, being the CNS crucial to this antecipatory mechanism. Putting this, acquisition and practice of motor skills under different contexts such as non-reactive and reactive circunstances, challenging decision-making, single or sequenced patterns, low and high intensities are extremely important in order to achieve motor learning, and subsequent injury prevention and performance enhancement. Until today, it has not been proved that proprioception can be improved by exercise. Despite that, proprioceptive information is only important during slow closed-loop activities, such as static single leg balance. However, being the vast majority of sports played with high speed, and injuries often occuring during high speed movements, proprioception is not effectively used under this circunstances. On the other hand, CNS has a very important role, so emphasis should be given to motor learning strategies in order to enhance performance and reduce the likelihood of injury. skeletal muscles. J Anat 2006;208(6):753e68. Gordon J. and Ghez C., (1991). Muscle receptors and spinal reflexes: the stretch reflex. in: E. Kandel, J. Schwartz, T. Jessell (Eds.) Principles of neural science. Prentice-Hall International, London; 1991:564–580. Granit R., (1970). The basis of motor control. Academic, New York, 1970. Horak F.B., (2006). Postural orientation and equilibrium: what do we need to know about neural control of balance to prevent falls? Age Ageing. 35(Suppl 2): ii7–ii11, 2006. Johansson H., Lorentzon R., Sjölander P. and Sojka, P., (1990). The anterior cruciate ligament: a sensor acting on the γ-muscle-spindle systems of muscles around the knee joint. Neuro Orthop. 1990;9:1–23. Lephart S.M., and F.H. Fu., (2000). Proprioception and neuromuscular control in joint stability. Human Kinetics. 2000. Liu J., Thornell L. and Pedrosa-Domellof F., (2003). Muscle sindles in the deep muscles of the human neck: a morphological and immunocytochemical study. J Histochem Cytochem. 2003;51:175–186. Magill R.A., (2010). Motor learning and control: concepts and application. (9th ed.). New York, NY: McGraw-Hill, 2010. Martin J and Jessell T., (1991). Modality coding in the somatic sensory system. In: Kandel E, Schwartz J, Jessell T, editors. Principles of neural science. London: Prentice-Hall International Inc.; 1991. p. 341e52. Milia M., M.J. Siskosky, Y-X. Wang, J.P. Boylan, E.M. Wojtys, and J.A. Ashton-Miller., (1998). The role of the ankle evertor muscles in preventing inversion during a one-footed landing on a hard surface: an experimental study in healthy young males. Presented at the Annual Meeting of American Orthopaedic Society for Sports Medicine, Vancouver, 1998. Needle A., Charles B.B.S., Farquhar W., Thomas S., Rose W. and Kaminski T., (2013). Muscle spindle traffic in functionally unstable ankles during ligamentous stress. J Athl Train. 2013;48:192–202. Pollock A.S., B.R. Durward, P.J. Rowe, and J.P. Paul., (2000). What is balance? Clin Rehabil. 14: 402– 406, 2000. Proske U. and Gandevia S.C., (2012). The proprioceptive senses: their roles in signaling body shape, body position and movement, and muscle force. Physiol Rev. 2012;92:1651–1697. Riemann B. and Lephart S., (2002). 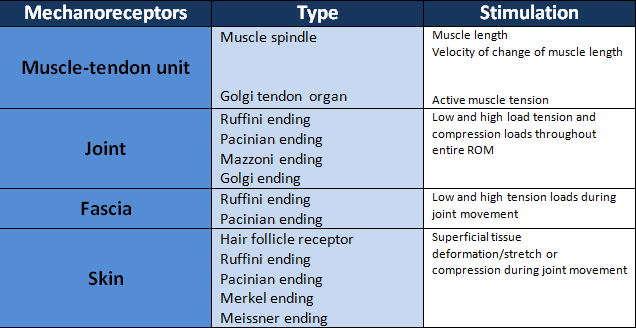 The sensorimotor system, part I: the physiologic basis of functional joint stability. J Athl Train 2002;37:71-9. Sojka P., Johansson H., Sjölander P., Lorentzon R. and Djupsjöbacka M., (1989). Fusimotor neurones can be reflexly influenced by activity in receptor afferents from the posterior cruciate ligament. Brain Res. 1989;483:177–183. Interesting discussion on some of the literature on human proprioception and balance, and training to improve resistance to injury. Yes proprioception, which is based on fixed numbers and specific types of position sensation receptors and nerve pathways likely is not improvable, if anything with aging deteriorates. However I would expect the motor response to proprioception both automatic and volitional to be improvable with repetition (training). As training can improve speed , power etc. which can act to improve position maintenance or voluntary or involuntary change in position, yes balance if trying to prevent change in position or facilitation of change in position, transitional imbalancing. Empirically most of us who do some physical training know that their balance and ability to imbalance has improved by training both by using various static positioning , strength and speed and endurance training. In the end , in practical terms regarding analysis of our training programming it doesn’t really matter to us that the scientific observation is that proprioception is not improvable, so much as that effects on how we function and how protected we are against injury, appear to be significantly improvable by our voluntary action of dedicated training. Next Post Which is the best exercise for injury prevention?